The appearance of the star cluster known as Matariki is a time to celebrate New Zealand's unique history and place in the world. 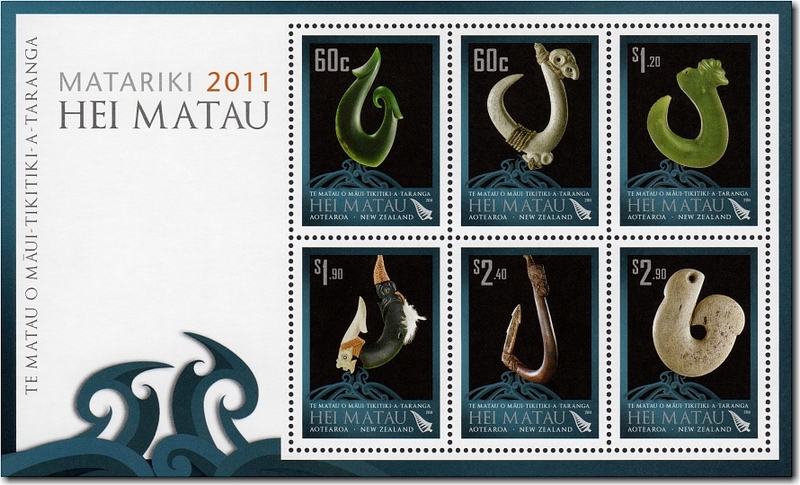 New Zealand Post marked the start of the Māori New Year with it's Matariki 2011 - Hei Matau stamp issue. Meaning 'fish hook', matau are traditionally an important aspect of Māori life, providing Māori with the means to catch their kai moana or 'food from the sea'. 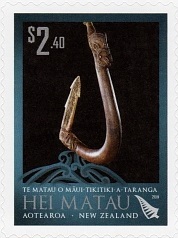 Many fishermen had their own 'lucky' fish hook, which they would wear around their necks (hei matau) for safe keeping. Today hei matau are used less for catching fish and more for catching someone's eye when worn as pendants. They remain a cultural treasure (taonga) and have an important link to the origins of Aotearoa, New Zealand. According to Māori legend, New Zealand's North Island was once a giant fish that was caught by the half-god and seafarer Māui, using a woven line and his magic bone matau. Hei matau have a strong connection to Tangaroa, god of the sea, and as such the stamps in this issue feature the commonly stylised element of the sea. 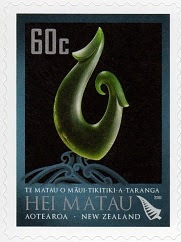 Meaning 'the fish hook of Māui', the phrase 'Te matau o Māui-tikitiki-a-Taranga' has also been incorporated into the design. See our collection Matariki - Maori New Year. See our Index on New Zealand Maori. 60c - Modern Pounamu (Greenstone) Hei Matau. This modern hei matau has been handcrafted by Lewis Gardiner (Ngāti Pikiao, Ngāti Awa, Te Whānau-a-Apanui, Ngāi Tahu). Made from pounamu, it is representative of strength, abundance and provision. 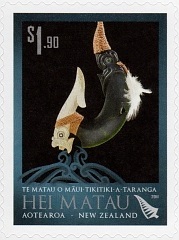 Commissioned specifically for this stamp issue, it is now a part of the New Zealand Post Collection. 60c - Pre 1800 Manaia (Spiritual Guardian) Hei Matau. This hei matau dates from 1500 to 1800, is housed in The Museum of New Zealand - Te Papa Tongarewa and is an example of a functional fish hook that might have hung around a fisherman's neck. Made from whalebone, it's elaborately carved with manaia (Māori spiritual guardian) faces at the apex of the shank and also at the bait-knob. The traditional hook shape is designed to cut into the fish's mouth. $1.20 - 1800 Inanga (Milky White Greenstone) Hei Matau. This hei matau dates from around 1800 and is also housed in Te Papa Tongarewa. Sourced from Westland in the South Island, it is made from inanga (milky white) pounamu. The elaboratively carved crown is entirely decorative, and the barb point has also been decorated with delicate notching. $1.90 - Te Puia (New Zealand Maori Arts and Crafts Institute) Hei Matau. 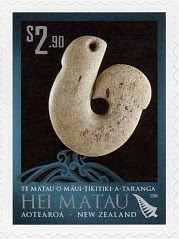 This hei matau was crafted for this stamp issue by Te Puia, the New Zealand Māori Arts and Crafts Institute. Made by Lewis Gardiner, Head of the National Bone, Stone and Greenstone Carving School, it is based on the traditional pā kahawai, i.e. made from multiple materials and lashed together. Pounamu, whalebone, feathers and muka (flax fibre) are used for the hook, while the eye inserts are made with paua. $2.40 - Wooden Pukengaki Hei Matau. Housed in the Auckland War Memorial Museum (Tamaki Paenga Hira), this hei matau is made from wood and dates from around 1800. The wood was trained to grow into the shape of a fish hook, then carved and combined with an unusually large bone barb designed to hook the fish’s mouth securely. 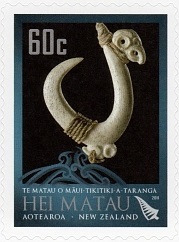 The top of the hook features an intricately carved manaia face. $2.90 - 1750 - 1850 Tohora Hei Matau. Also housed in Te Papa Tongarewa, this hei matau dates from 1750 to 1850. 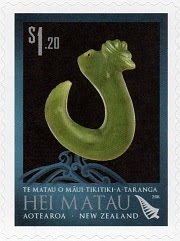 It is a classic symbolic representation of the fish hook used by the Polynesian cultural hero Māui. Made from whalebone, some say its shape is designed to wedge in the fish’s mouth rather than hook it. 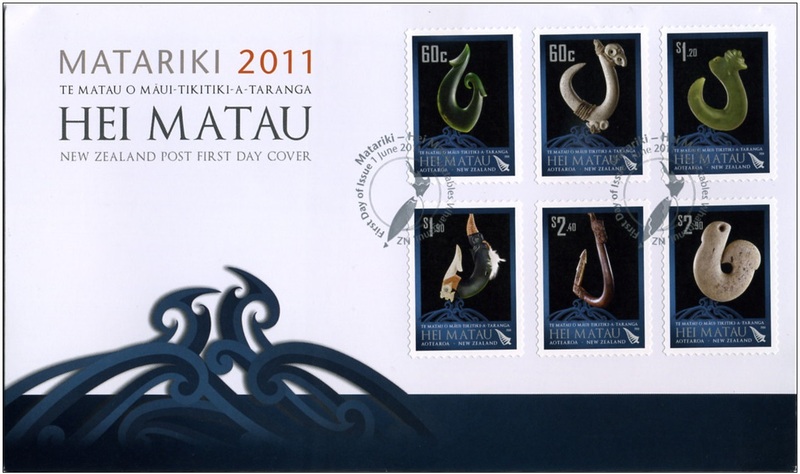 2011 Matariki First Day Cover. Self-adhesive: Tullis Russell PSA red phosphor stamp paper 220gsm; Gummed miniature sheets: Tullis Russell 104gsm red phosphor gummed stamp paper. Gummed: 13.33 x 13.60; Self-adhesive: die-cut.